She actually made Vice Admiral on Thursday Stardate 89786.66, so why did it take till Saturday morning to let you know? Glad you asked, it actually is a combination of two things. First, I kinda got swept up in the story line… Okay who am I kidding? I definately got swept up in it. Then because of a piece of gear I found, I got swept up in Strategic Task Force missions. Rather than grind my way up through doing daily missions, or patrols I decided to go with the Episodes. The episodes can be quickly summed up as the main storyline of the game. It starts off where most people who love Star Trek did, in the Klingon war. After moving through the various pieces of the war, it advances to the Romulans, Cardassians, Borg, Breen, and finally the Undine. Who are the Undine? They are species 8472 from the Voyager series. Now, I won’t spoil the finale but I think I am going to do walkthroughs for the various parts of the series as time permits. There are a few rough spots where I am sure people could use a hand. But let me say this, there is a ton of story here. I am one of those players that normally just blasts through trying to make it to the end game. I can tell you that while I ripped through the Klingon and Romulan portions, I started to take it a little slower and read a little more starting with the Cardassians. By the time I hit the Breen, I was moving quickly again, but this time I was moving quickly because I wanted to know what happens next. The experience was like reading a really good book that tantalizes you in the beginning, then hooks you in the middle, and by the time you hit the end you are wanting more. Well, the wanting more part was a bit disconcerting. What happens next? I want to know! So there is a section called featured series. The one that is up there now is called the 2800. I will be doing posts on it as well, it is a series based around deep space 9. While it looks as though it fits in before the Cardassian section of the main story, this is the first time I have seen it and it isn’t finished yet. They bring out new episodes periodically so I will have to wait and see. Now, some of the more observant among you may notice that there is Borg equipment attached to her hull. 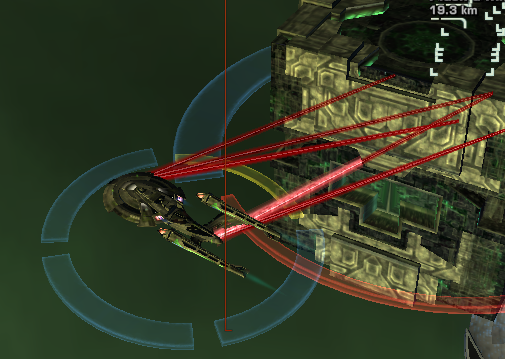 Specifically, its a Borg shield emitter. How it got there is the story though. You see during one of the Undine episodes, you have the option to choose a Borg console as a reward. This console is a set piece. Like most end game items in an MMO, you have 2 choices, you either go with high end gear that you piece together or you go with pieces that are part of a set. This particular set piece is pretty nice by itself, but it is part of a four piece set. So, like any other good addict I started researching where I could find the other pieces of this set. It turns out that the rest of the set comes from the Strategic Task Force missions. They are normally abbreviated as STF’s and I am going to do so here because it is a pain to type it out. STF missions are alot tougher than normal episodes and tend to be what most people that I have spoken to in the game consider end game content. There are space missions and ground mission right now three different types of each. That doesn’t tell the whole story of course because there are two different difficulty levels as well, normal and elite. Okay, so normal well pretty much anyone can hop into a normal around level 46 and if they have been upgrading their gear and skills along the way should be able to muddle through. But elite, that is a different world. I tried my first elite today, and I can tell you that you had better be prepared. They can and do one shot your ship. Your ship will receive injuries when you die, and you had better fix them. Okay, that was a little off track but suffice it to say I got the urge to upgrade. When you run STF’s you can get Borg salvage and Encrypted Data Chips, these are like tokens that can be turned in for gear at various vendors. The gear is all designed to make you a more efficient Borg slayer. And the gear is really good, I went from killing a Borg cube solo in about three minutes to killing one solo in about a minute. So yeah, the gear rocks. There are several sets, Borg, M.A.C.O. and the Omega set currently for the federation. Okay, I am pretty happy with the equipment so far. Now, as you reach Vice Admiral and start running STF’s and trying to get gear you will find out that it takes a little time to do so. The so called grind factor. 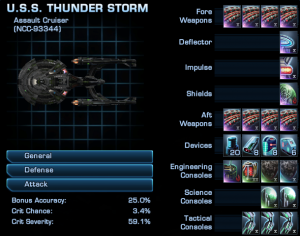 I got lucky a few times and had rare Borg salvage drop along with the token for the deflector and engine. Those weapons are Anti-proton arrays, basically they are critical hit machines! I absolutely love watching those critical hits scroll by. The problem with that of course is that you are doing tons of damage and everything is going to focus on you. 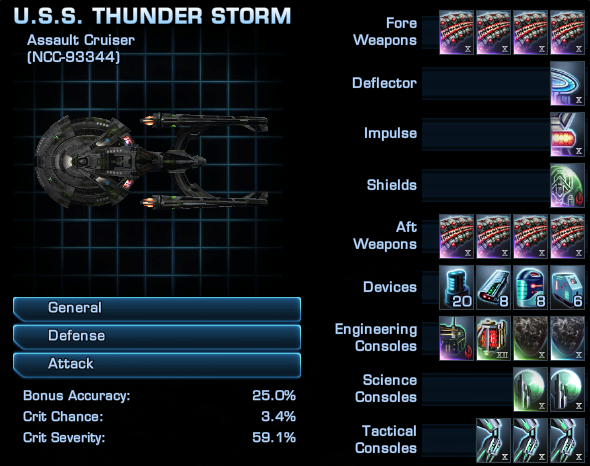 So far, I have the eight Anti-proton arrays, M.A.C.O deflector, M.A.C.O. impulse engines, Assimilated shield array, and the Assimilated universal console. All of this took about 10 hours to get. Now admittedly it’s all the Mk X version of the gear but it’s a good start. Just like all good stories, there are two sides. Well, okay this is Star Trek so there can be hundreds, but the one that we can actually play right now is the Klingon side. The problem with Klingons, at least as far as the public is concerned is that there is very little written about them. For the most part, all the guides, tips, etc are written for the federation side of things. 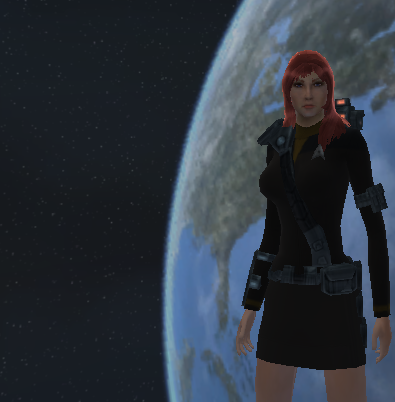 Probably because you can’t even start a Klingon character until you reach level 24 as a federation captain. I am going to try to change that though. I have started a Klingon character as well, and will be adding guides from the Klingon Defense Force side of things as well.